It was the preseason of junior Elise Larson’s freshman year when her coach told her to go outside to push a football sled. After swimming that morning, the girls varsity swim team took a two-hour break and then returned for their dryland practice. Larson first thought pushing football sleds was irrelevant to swimming, but later realized it helped the team grow closer because they all had to work together to push one football sled. According to head coach Jon Robin Walker, it was unbelievable watching the girls push the sled. 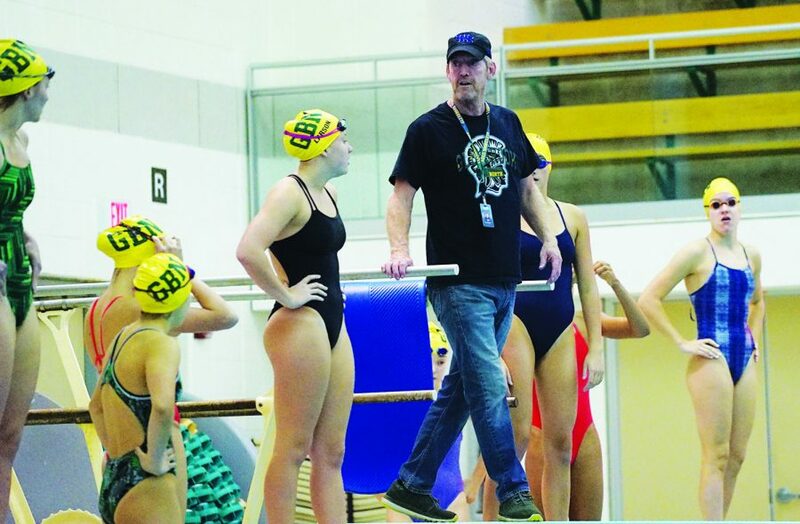 After 33 years of coaching swimming, 27 of which were at Glenbrook North, Walker is entering his last season of coaching and he plans to retire after this school year. 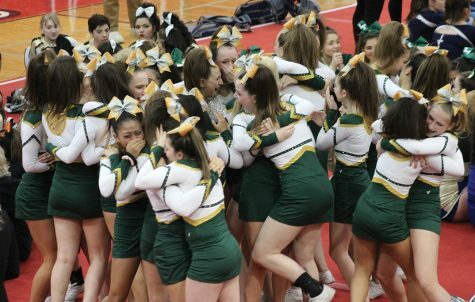 John Fournier, head junior varsity coach, said during Walker’s career, he has had over 20 teams win conference championships, has over 100 dual meet conference wins and has placed girls at the state meet every year. Walker said when the girls step up on the block, the lane is theirs and they can do whatever they want with it. Senior Jaclyn Mattson said before the state meet, Walker sets a timer for the girls’ goal times and has them mentally visualize what it would be like to swim their races. “I think [visualizing] helps because it gets you thinking in the right mindset,” Mattson said. According to junior Molly Fraser, Walker assists every athlete, regardless of her ability. “I had to fix my breaststroke kick, so he gave me a special [piece of equipment] to use that would help me … apply that fix,” Fraser said. According to Walker, it takes courage to get through a swim season because the team practices four mornings and five afternoons per week. “They are challenging themselves physically and their [bodies] adapt. “I have utmost respect for them,” Walker said. Walker said on Columbus Day, the girls swam 11,000 yards, or 6.4 miles, a set which required self-discipline and self-control. Fraser said Walker is constantly motivating the girls, making it easier to wake up and complete the most difficult sets. He also reassures Fraser that she is stronger than she thinks she is, even when she has a bad race. As of Oct. 26, the team has achieved a dual meet record of 2-5. 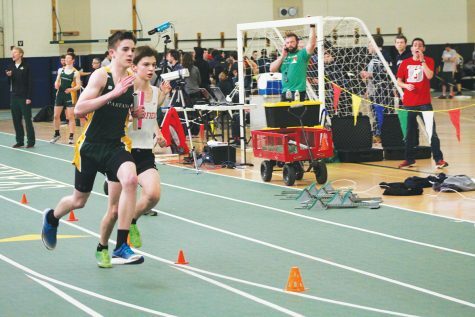 Fraser said at invites, the team has not been placing very high because other schools in the area are performing well, but individually, many of the girls are getting their best times. Walker said although the girls have had trouble matching up competitively with many teams, there are individual GBN swimmers who compete with the best girls in the state. 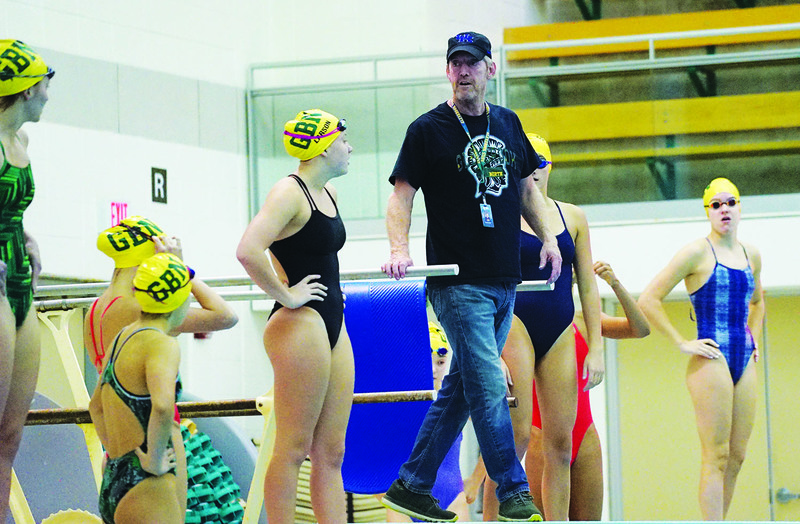 According to Fraser, the swim program will be very different without Walker coaching next year, as he has been at GBN for over 20 years. “We are comfortable with him, we trust him, and we understand his rules and what he wants us to do, how he wants us to act as a team,” Fraser said. When asked about his thoughts on his retirement, Walker said he feels overwhelmed yet grateful.